2-) Add 2 mL Trypsin on cells. Be careful; Trypsin should be spreaded whole surface. Then wait 5 minute at 37°C. Because trypsin works maximum activity at 37 ° C.
3-) After we sure that cells remove from surface completely, wash the surface carefully with 5 mL medium via pipetting . 4-) Take all the mixture which we prepared to falcon tubes( 15 mL) and centrifuge 6 minutes. 5-) Supernatant should be taken carefully without damaging to cells. 6-) Add 5 mL medium on pellet and dissolve the pellet in medium. 7-) Take 100 mL from cell mixture, take 100 mL from Tripan-Blue and mix in eppendorf. 8-) Take 20 micro liters to Hemocytometer( Thoma lam) and count after then. 9-) We will put the lam to microscope. Lam’s H zone should be under the light. 10-) There are 5 areas that should be counted. 11-) Total number of cells which at 5 areas, are counted at arithmetic average is counted. *For example; 68x2x=1.360.000(cell count per mL). But we want to seed 500.000 cell per mL. *So we will take 0.385 microliters to seed 500.000 cells. *According to the material ( where will we seed our cells? Flask, petri, well..) amount of medium is counted and the cells are seeded. 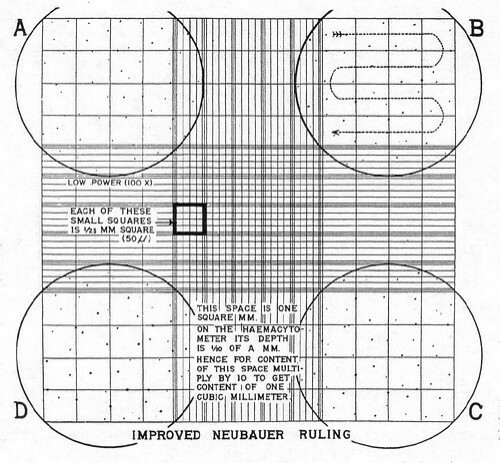 *For example, according to six well-plate; 2 mL medium is put, Than 385 microlitres cells are added. *For six well-plate, the best situation is adding 500.000 cells. 1 -) The medium stored at +4 ° C, is heated at 37 ° C at least 30 minutes. 2 -) Remove all mediums from the flasks carefully without damaging the cells. At this stage, the medium is in the flask, can be poured directly or can be taken with pipette. 3 -) 10 mL medium is taken which heated and clean, is added to in the middle of flask. This stage is done very slowly and absolutely avoiding the cells. After than flask is careened slowly (medium should not touch to flask’s cap) to mix the cells with medium. 4-) While changing medium, we must be careful and fast as much as we can. 1 -) Set Benmari at 37 ° C.
2 -) The cell line stored at -80 ° C, is brought to cell culture room in ice. Then put in 37 °C and wait 2 minutes. 3 -) After melting cells for 2 minutes, cryovial tubes are cleaned with alcohol and their caps are opened. 4 -) All the stock cells are put in to 5 mL medium placed 15 mL falcon tubes. 5 -)Do pipetting the Medium-Cell mixture carefully. At this stage, it is important not to harm the cells. So don’t work fast, don’t hurry. Work slowly and gentle. 6 -) Put 9 mL medium is to 75 mL empty flask. 7 -) Add the mixture, which was prepared in falcon tube, to flask. Shake gently to the left and the right way up and down carefully. Take care to never touch the mixture to flask’s cap. 8 -) Put the cells into the incubator and set at 37 ° C and %5 CO2. Pick a single colony into 5ul of NFW. (Fresh colonies grown that day work best, but they can also come from 4 C). Boil for 5 min at 95C. Keep all the reagents at 4C while preparing the mixture. Pre-heat the thermocycler to 95C and transfer your reaction directly from 4 C.
1-) Streak DH5α directly from a frozen stock onto LB agar plate (Amp-). 2-) Incubate at 37℃ for 12 h.
3-) Inoculate one well isolated colony into 5ml of LB(Amp-). Microwave for 3 mins (until the agarose has dissolved completely and there is a nice rolling boil). Let agarose solution cool down for 5min. Add 3.6 ul EtBr and pour the agarose into a gel tray with the suitable well comb in place (pour slowly to avoid bubbles which will disrupt the gel). Wait 20-40 mins until poured gel has completely solidified. -All purification steps should be carried out at room temperature. Excise gel slice containing the DNA fragment using a clean scalpel or razor blade. Cut as close to the DNA as possible to minimize the gel volume. Place the gel slice into a pre-weighed 1.5 ml tube and weigh. Record the weight of the gel slice. Note. If the purified fragment will be used for cloning reactions, avoid damaging the DNA through UV light exposure. Minimize UV exposure to a few seconds or keep the gel slice on a glass or plastic plate during UV illumination. Add 1:1 volume of Binding Buffer to the gel slice (volume: weight)(e.g., add 100 ul of Binding Buffer for every 100 mg of agarose gel). Note. For gels with an agarose content greater than 2%, a dd 2:1 volumes of Binding Buffer to the gel slice. Incubate the gel mixture at 50-60°C for 10 min or until the gel slice is completely dissolved. Mix the tube by inversion every few minutes to facilitate the melting process. Ensure that the gel is completely dissolved. Vortex the gel mixture briefly before loading on the column. Check the color of the solution. A yellow color indicates an optimal pH for DNA binding. If the color of the solution is orange or violet, add 10 ul of 3 M sodium acetate, pH 5.2 solution and mix. The color of the mix will become yellow. Optional: use this step only when DNA fragment is inf 500 bp or sup10 kb long. If the DNA fragment is inf 500 bp, add a 1:2 volume of 100% isopropanol to the so lubilized gel solution (e.g. 100 ul of isopropanol should be added to 100 mg gel slice solubilized in 100 ul of Binding Buffer). Mix thoroughly. If the DNA fragment is sup10 kb , add a 1:2 volume of water to the solubilized gel solution (e.g. 100 ul of water should be added to 100 mg gel slice solubilized in 100 ul of Binding Buffer). Mix thoroughly. Transfer up to 800 ul of the solubilized gel solution (from step 3 or 4) to the GeneJET purification column. Centrifuge for 1 min. Discard the flow-through and place the column back into the same collection tube. Note. If the total volume exceeds 800 ul, the solution can be added to the column in stages. After each application, centrifuge the column for 30-60 s and discard the flow-through aftereach spin. Repeat until the entire volume has been applied to the column membrane. Do not exceed 1 g of total agarose gel per column. Optional: use this additional binding step only if the purified DNA will be used for sequencing. Add 100 ul of Binding Buffer to the GeneJET purification column. Centrifuge for 1 min. Discard the flow-through and place the column back into the same collection tube. Add 700 ul of Wash Buffer (diluted with ethanol as described on p. 3) to the GeneJET purification column. Centrifuge for 1 min. Discard the flow-through and place the column back into the same collection tube. Centrifuge the empty GeneJET purification column for an additional 1 min to completely remove residual wash buffer. Note. This step is essential to avoid residual ethanol in the purified DNA solution. The presence of ethanol in the DNA sample may inhibit downstream enzymatic reactions. Transfer the GeneJET purification column into a clean 1.5 ml microcentrifuge tube (not included). Add 50 ul of NFW to the center of the purification column membrane. Centrifuge for 1 min. Note. For low DNA amounts the elution volumes can be reduced to increase DNA concentration. An elution volume between 20-50 ul does not significantly reduce the DNA yield. However, elution volumes less than 10 ul are not recommended. If DNA fragment is sup10 kb, prewarm Elution Buffer to 65°C before applying to column. If the elution volume is 10 ul and DNA amount is inf5 ug, incubate column for 1 min at room temperature before centrifugation. Discard the GeneJET purification column and store the purified DNA at -20°C. 1-) Add 200 mL of dH2O to a graduated cyclindar. 2-) Transfer dH2O into glass bottle. 6-) Pour the plates . 1. For high copy number plasmids, use 15–25 mL of an overnight LB culture per sample in a disposable 50-mL conical tube. Note: If you are using >25 mL of culture volume of high copy plasmids, add twice the amount of Resuspension Buffer (R3) with RNase A, Lysis Buffer (L7), and Precipitation Buffer (N3) as directed in steps 3, 4, and 5, below, for best results. For low copy number plasmids, use 25–100 mL of an overnight LB culture per sample in a 50-mL tube. 2. Harvest the cells by centrifuging the overnight LB culture at 4000 × g for 10 minutes. Remove all medium. 3. Add 4 mL Resuspension Buffer (R3) with RNase A to the cell pellet and resuspend the cells until homogeneous. 4. Add 4 mL Lysis Buffer (L7). Mix gently by inverting the capped tube until the lysate mixture is thoroughly homogenous. Do not vortex. Incubate at room temperature for 5 minutes. Note: Do not allow lysis to proceed for more than 5 minutes. 5. Add 4 mL Precipitation Buffer (N3) and mix immediately by inverting the capped tube until the mixture is thoroughly homogeneous. Do not vortex. 6. Centrifuge the mixture at >12,000 × g for 10 minutes at room temperature. Note: If the pellet does not adhere to the bottom of the tube, incubate the tube at room temperature for 5 minutes to allow the lysate and gelatinous pellet to separate. Pipet the clear lysate into another, sterile tube and centrifuge at >12,000 × g at room temperature for 5 minutes to remove any remaining cellular debris. 7. Proceed to Binding and Washing DNA, next page. 1. Load the supernatant from step 6 (Preparing Cell Lysate) onto the equilibrated column. Allow the solution in the column to drain by gravity flow. 2. Wash the column twice with 10 mL Wash Buffer (W8). Allow the solution in the column to drain by gravity flow after each wash. Discard the flow-through. 3. Proceed to Eluting and Precipitating DNA. For DNA precipitation, you can use the PureLink® HiPure Precipitator Module (page 34) which allows you to precipitate DNA within 10 minutes without using a centrifuge. Alternatively, follow Eluting and Precipitating DNA on page 14 to perform traditional DNA precipitation using centrifugation. Refer to the manual supplied with the PureLink® HiPure Precipitator Module for a detailed protocol. 1. Place a sterile 15-mL centrifuge tube (elution tube) under the column. 2. Add 5 mL Elution Buffer (E4) to the column to elute the DNA. Allow the solution to drain by gravity flow. Do not force out any remaining solution. The elution tube contains the purified DNA. Discard the column. 3. Add 3.5 mL isopropanol to the elution tube. Mix well. Note: Proceed to the protocol described in the PureLink® HiPure Precipitator manual after this step, if you are using the precipitator module. 4. Centrifuge the tube at >12,000 × g for 30 minutes at 4°C. Carefully remove and discard the supernatant. 5. Resuspend the pellet in 3 mL 70% ethanol. 6. Centrifuge the tube at >12,000 × g for 5 minutes at 4°C. Carefully remove and discard the supernatant. 7. Air-dry the pellet for 10 minutes. 8. Resuspend the DNA pellet in 200 µL TE Buffer (TE). For low copy number plasmids, use 100 µL of TE Buffer. Note: Occasionally, insoluble particles may be present. These particles do not influence the quality of the DNA and can be easily removed. To remove insoluble particles, centrifuge the DNA solution at high speed for 1 minute at room temperature. Transfer the supernatant (DNA sample) into a fresh tube. Storing DNA To avoid repeated freezing and thawing of DNA, store the purified DNA at 4°C for immediate use or aliquot the DNA and store at –20°C for long-term storage. Resuspend the pelleted cells in 250 ul of the Resuspension Solution. Transfer the cell suspension to a microcentrifuge tube. The bacteria should be resuspended completely by vortexing or pipetting up and down until no cell clumps remain. Note. Ensure RNase A has been added to the Resuspension Solution. Add 250 ul of the Lysis Solution and mix thoroughly by inverting the tube 4-6 times until the solution becomes viscous and slightly clear. Note. Do not vortex to avoid shearing of chromosomal DNA. Do not incubate for more than 5 min to avoid denaturation of supercoiled plasmid DNA. Add 350 ul of the Neutralization Solution and mix immediately and thoroughly by inverting the tube 4-6 times. Note. It is important to mix thoroughly and gently after the addition of the Neutralization Solution to avoid localized precipitation of bacterial cell debris. The neutralized bacterial lysate should become cloudy. Centrifuge for 5 min to pellet cell debris and chromosomal DNA. Transfer the supernatant to the supplied GeneJET spin column by decanting or pipetting. Avoid disturbing or transferring the white precipitate. Centrifuge for 1 min. Discard the flow-through and place the column back into the same collection tube. Note.Do not add bleach to the flow-through. Add 500 ul of the Wash Solution (diluted with ethanol) to the GeneJET spin column. Centrifuge for 30-60 seconds and discard the flow-through. Place the column back into the same collection tube. Repeat the wash procedure (step 7) using 500 ul of the Wash Solution. Discard the flow-through and centrifuge for an additional 1 min to remove residual Wash Solution. This step is essential to avoid residual ethanol in plasmid preps. Transfer the GeneJETspin column into a fresh 1.5 ml microcentrifuge tube. Add 50 ul of the NFW to the center of GeneJET spin column membrane to elute the plasmid DNA. Take care not to contact the membrane with the pipette tip. Incubate for 2 min at room tempera ture and centrifuge for 2 min. Note. An additional elution step (optional) with Elution Buffer or water will recover residual DNA from the membrane and increase the overall yield by 10-20%. For elution of plasmids or cosmids sup20 kb, prewarm Elution Buffer to 70°C before applying to silica membrane. Discard the column and store the purified plasmid DNA at -20°C. 1)Remove all mediums from flasks carefully. Then check the cells at inverted microscope. 2)Wash cells with 4 mL 1X PBS twice. 3)Put 2 mL trypsin-EDTA slowly drop by drop to the surface (the narrow side at the flask) where cells attached. 4)Wait 3-5 minute until cells remove from surface. 5)If the surface is clean, this means that cells are peeled off from surface. On the other hand checking at microscope is the best way. If cells do not peel off, we can interfere by tapping the bottom of the flask. 6)Add 8 mL medium in the flask. The medium is added to flask from the surface where cells are there. Than to mix more pipetting is done. Than all mix is taken to falcons which their volume is 15 mL. 7)Centrifuge 6 minute at 1100 rpm. 9)Add 8 mL new medium. 10)The mixture is mixed until the medium and the cells mix completely. 11)Transfer the cells from falcons to flasks. Shake flasks gently. 12)Before placing the cells, put the medium. 13)Put the flasks to incubator which the incubator; 37 ° C and 5% CO2. There are two different medium at cell culture. Add these substances respectively to medium. While adding the substances, FBS melting should be done at room temperature. Medium should be stored at +4 °C. Before using, we should heat thirty minutes at 37 °C in benmari. To prepare 500 mL 1X PBS; 450 mL distilled water should be added to 50 mL PBS stock. Transfect cells according to the following chart. Volumes are given on a per-well basis. Each reaction mix is sufficient for triplicate (96-well), duplicate (24-well), and single well (6-well) transfections, and accounts for pipetting variations. Adjust the amounts of components according to your tissue culture format. Incubate cells for 1–3 days at 37°C. Then analyze transfected cells. 2-) Place 500 uL LB in epp into heat block(42˚C). 3-)Thaw 50 uL competent cells on ice. 4-)Add 2 uL plasmid into the competent cell epp and incubate for 5 min on ice . 5-)Incubate at 42˚C for 30 sec in heat block. 6-)Incubate for 2,5 min on ice. 7-) Complete to 200 uL with pre-heated LB (42˚C). 8-) Epp s adhered with tape to horizontal on shaker. 9-)Incubate at 37 C for 30 min at 240 rpm. 10-)Spread 125-150 uL from each tube on agar plates with suitable antibiotic. 11-)Incubate plates at 37˚C 16 h .
2.Add below 50mM pH 7.0 KPO4 buffer and mix well store at 4 C.
Before starting application dissolve 2,5 mg NADPH in above mix. Complete 2,15 cc H2O2to 100 ml. Cells homogenizate in homogenization buffer (1/10 w/v). Centrifuge at 2000g(3500 rpm) at 0-4 C for 15 min. One control tube is measured for each NADPH mix. Instead of sample, add DW and measured as sample. Note:If your sample is liver tissue you diluate sample 1/5 or 1/10. Measured absorbance change in a spectrophotometer at 340 nanometers for 5 min. 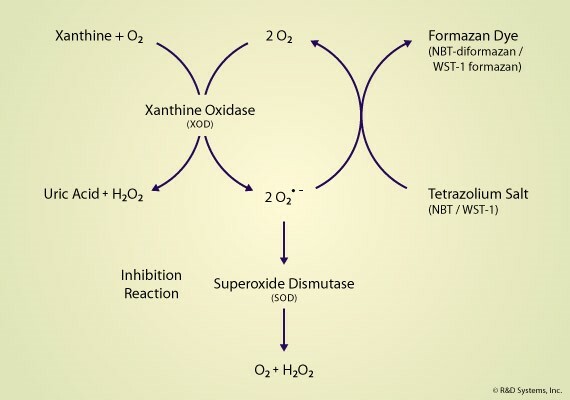 This assay for superoxide dismutase (SOD, EC 1.15.1.1) activity involves inhibition of nitroblue tetrazolium reduction, with xanthine-xanthine oxidase used as a superoxide generator. By using a reaction terminator (CuCl2) SOD activity measured within 30 minutes. Add 4,56 mg stock Ksantin in 10 cc distelled water and add 6-7 drops of 2,5N NaOH. Add 22,3 mg EDTA in 100 cc distelled water. Add 12 mg NBT İN 100 cc distelled water. Add 4,24 mg Na2CO3 100 cc distelled water. Add 6 mg BSA in 6 cc distelled water. Add 10,76 mg CuCl2 in 100 cc distelled water. Note: For preparation 2M (NH4)2SO4 2,64 gr (NH4)2SO4 in 10 cc distilled water. Centrifuge at 5000g (7000 rpm) for 1 min. Centrifuge the tube at 5000g for 2 hour at 4°C. Measured in a spectrophotometer at 560 nanometers against distelled water. Sun Y,Oberley LW,Li Y. A simple method for clinical assay of superoxide dismutase. Clin Chem.1988 Mar;34(3):497-500. Add 80 μl of AssayMix and 20 μl of standard and/or sample. Read at 405 nm every hour for 8 hours. Read at 405 nm every hour from 20 hours up to 26 hours. The AssaySense Human tPA Chromogenic Activity Kit is developed to determine human tPA activity in plasma and cell culture supernatants. The assay measures the ability of tPA to activate the plasminogen to plasmin in coupled or indirect assays that contain tPA, plasminogen, and a plasmin-specific synthetic substrate. The amount of plasmin produced is quantitated using a highly specific plasmin substrate releasing a yellow para-nitroaniline (pNA) chromophore. The change in absorbance of the pNA in the reaction solution at 405 nm is directly proportional to the tPA enzymatic activity. The activity assay kit contains sufficient reagents to perform 100 tests using the microplate method. • Sealing Tapes: Each kit contains 3 precut, pressure sensitive sealing tapes that can be cut to fit the format of the individual assay. • Plasma: Collect plasma using one-tenth volume of acidified 0.5 M sodium citrate (pH 4.0) as an anticoagulant to prevent tPA-PAI complex formation. Centrifuge samples at 3000 x g for 15 minutes. Prior to the analysis, dilute samples 1:8 with Assay Diluent and incubate at room temperature for 10 minutes to overcome interference by plasmin inhibitors (6 - 7). Samples can be stored at < -80°C. Avoid repeated freeze-thaw cycles. • Cell Culture Supernatants: Centrifuge cell culture media at 3000 x g for 15 minutes at 4°C to remove debris. Collect supernatants and assay. Samples can be store at < -80°C. Avoid repeated freeze-thaw cycles. • Standard Curve: Reconstitute 32 IU of Human tPA Standard with 0.8 ml of Assay Diluent to generate a solution of 40 IU/ml. Allow the standard to sit for 15 minutes with gentle agitation prior to making dilutions. 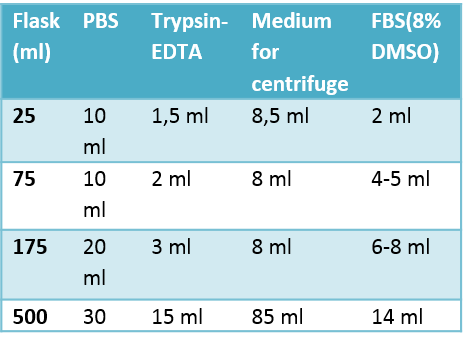 Prepare duplicate or triplicate standard points by serially diluting the standard solution (40 IU/ml) 1:4 with Assay Diluent to produce 10, 2.5, 0.625, 0.156, and 0.039 IU/ml solutions. Any remaining solution should be frozen at -20°C and used within 30 days. • Prepare all reagents, working standards and samples as instructed. Bring all reagents to room temperature before use. The assay is performed at room temperature (25°C) for specific sample binding and at 37°C for chromogenic activity assay. Seal the plate with sealing tape at each step. • Remove excess microplate strips from the plate frame. • Assay Mix: Freshly prepare the desired volume of the Assay Mix by combining the following reagents according to the assay numbers (n). It is recommended that Assay Mix be made in 10% excess. • Add 80 μl of the above Assay Mix to each well. • Add 20 μl of Human tPA Standard or samples per well and mix gently. • Read the absorbance at 405 nm at zero minutes for background O.D. Seal the plate with sealing tape. Incubate the plate at 37°C in a humid incubator to avoid drying the plate. • For HIGH tPA activity samples, read the absorbance at 405 nm every hour up to 8 hours. • For LOW tPA activity samples, start to read the absorbance at 405 nm from 20 hours up to 26 hours. • Calculate the mean value of the duplicate or triplicate for each standard and sample. • To generate a standard curve from the initial reaction time, plot the graph using the standard concentrations on the x-axis and the corresponding mean 405 nm absorbance or change in absorbance per minute (ΔA/min) on the y-axis. The best-fit line can be determined by regression analysis of the linear portion of the curve. • Determine the unknown sample concentration from the Standard Curve and multiply the value by the dilution factor. • The curve is provided for illustration only. A standard curve should be generated each time the assay is performed. • The minimum detectable dose of tPA is typically ~ 0.03 IU/ml.